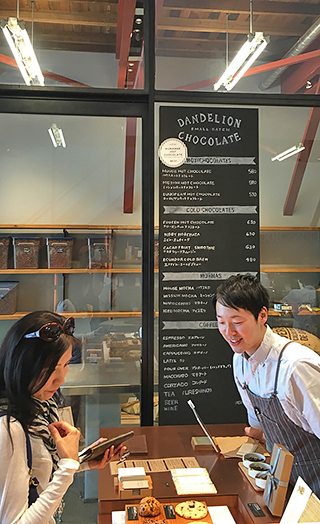 If you find the wait for a seat at Dandelion Chocolate’s flagship store in the Mission disheartening, we found the solution (at least until the ginormous space @ 16th & Harrison opens): Dandelion Chocolate Tokyo! 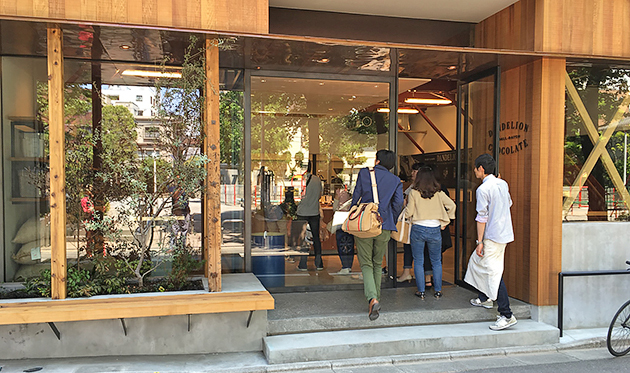 On our trip to Japan in May 2016, Ronnie & I made sure to include a visit to Dandelion’s new-ish (opened Feb. 2016) factory+store in Tokyo. We are pleased to report it’s a wonderful experience. It’s the same Dandelion vision, but with a Japanese vibe and plenty of seats! I was a little worried when we arrived shortly before opening, and a line was already forming. And it took a while to get to the front of the line, but as we approached, I saw that it was because most of the people in line had questions. 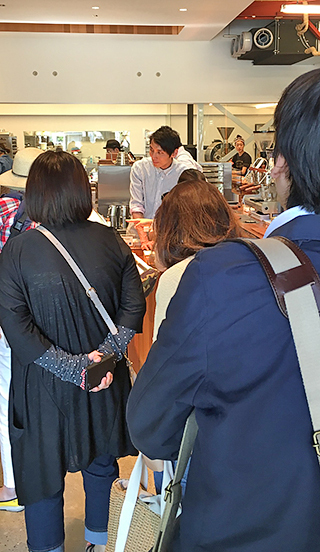 While I couldn’t understand what was being said because I don’t speak Japanese, it seemed that people wanted information about what they were buying — there was a lot of curiosity about the products before a decision could be made. And maybe because it was morning, once a decision was made, a lot of the orders were to go, so there was no reason to worry about finding a seat. 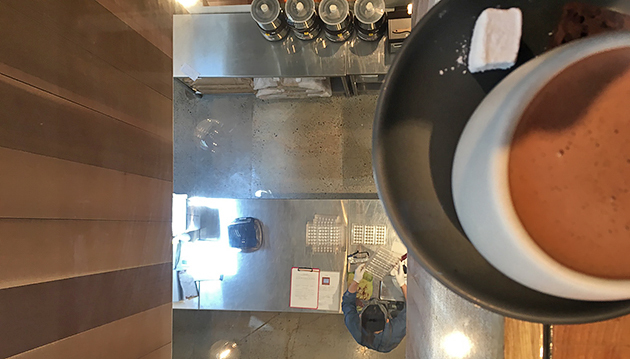 The factory+shop has a similar layout and architectural details to Dandelion’s Valencia St. location with the counter in front of an open kitchen and lots of wood, but seating is upstairs in a dedicated space. Balancing my hot chocolate as I climbed the stairs was really the only downside I could see in having the 2nd floor as seating. 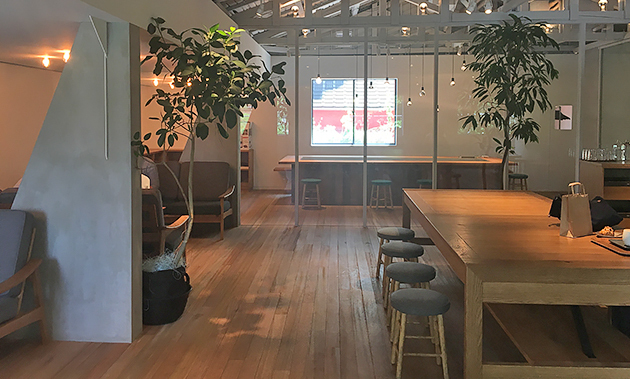 The large main area has several groupings of lounge chairs, small café table-&-chair sets, and one long workbench-type table with stools, with windows across the front overlooking the street and a school playground. The back space is glassed in, I assume for smokers because a lot of restaurants in Japan still allow smoking (unpleasant blast from the past), tho’ many do segregate the smokers in these kinds of rooms. However, there were no smokers when we were there, so we checked it out for ourselves. This room is dominated by a long wooden table with a glass insert running down the middle of the tabletop. This is actually a window looking down into the kitchen below. 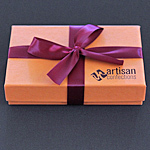 So you can enjoy your chocolate while watching the action in the kitchen from a bird’s eye view. Coolest table in the joint. We had made arrangements beforehand to meet with Mei Iida, Dandelion Tokyo’s head of education and HR. We wanted to find out how things were going in this SF outpost and what was the same/different in this version of Dandelion. While the menu looked familiar, Mei told us they have their own house hot chocolate drink: Puramai (which like Dandelion’s Mission hot chocolate is named in honor of an SF neighborhood) is named after a district in Osaka. 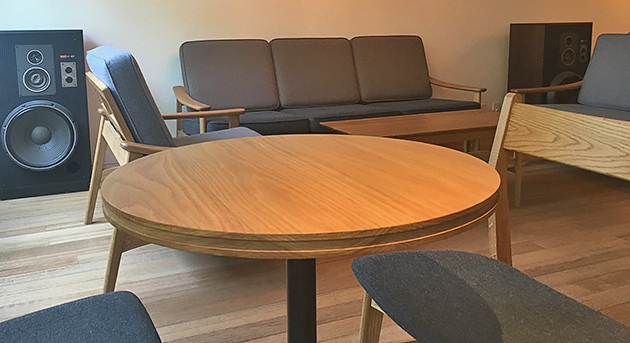 Like Dandelion, Nakamura also believes in transparency with its products. “You can trace where the tea comes from, according to its label,” Mei told us. The tea Dandelion Tokyo picked to use in their house hot chocolate is an organic leaf Hojicha (roasted tea), which Mei said has less caffeine. 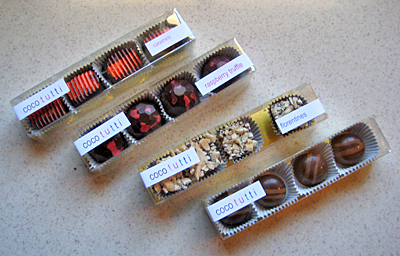 Their aim is to mix the essence of roasted tea with their own chocolate. We tried it and think they were successful: The tea is an after-note to the chocolate. It’s subtle, and I’m not sure what their chocolate tastes like on its own, but I think the two are blended nicely into a less sweet chocolate drink with a light roasted flavor lingering. And of course it came with their housemade marshmallow and a small nibby bread on the side, which was a little crunchy, a little salt-y and pretty yummy. 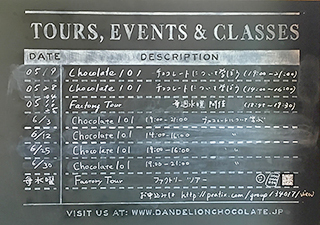 The store offers Dandelion’s Chocolate 101 classes as noted on their chalkboard, and every Wednesday they have a factory tour. Mei said that they plan to start offering the Chocolate 201 classes this summer. 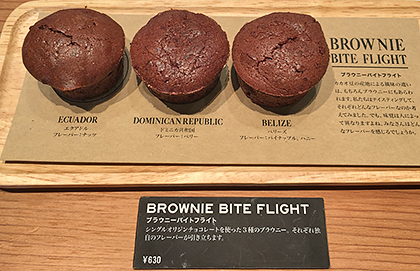 If we’d been in Tokyo a week earlier, we could have had a special treat. Mei told us Dandelion co-founder Todd Masonis was in town and did the Chocolate 101 class that week with Pastry Chef Lisa Vega doing Pastry 101 for the 1st time. Mei hopes to have more special events in the future. I’d say they are making something that would fit in lots of neighborhoods: Comfortable, pretty space with delicious treats and a gracious staff: who wouldn’t want that? Date posted: June 27, 2016. 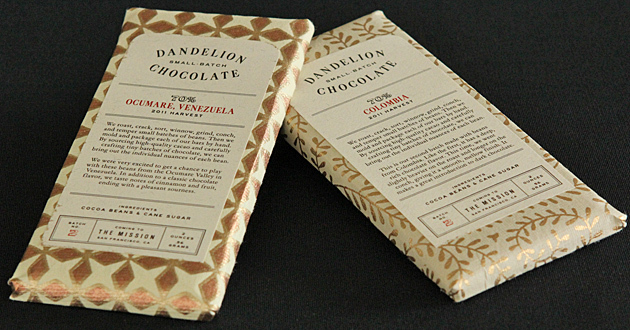 This entry was posted in Chocolate around the World, Featured, Front page, Local chocolate, Outside the Bay Area and tagged Dandelion Chocolate, hot chocolate, Japan, tea, Tokyo. Bookmark the permalink.